With EastConfort you can find Bucharest luxury apartments in central locations, that will suit every need and desire. All the Apartments in Bucharest are shownd below, ordered by popularity, price or the number of guests. 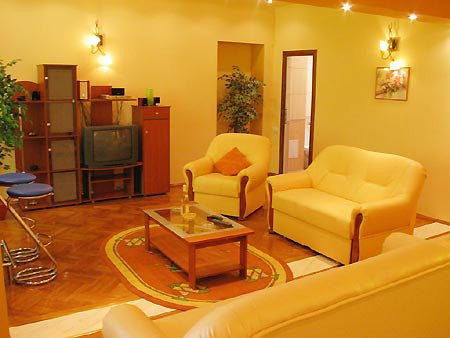 We offer you a luxury and fully equipped apartment in one of the best area of bucarest. Even for short rentals, it suits any activity, being a more competitive alternative to the hotel rooms. The three room apartment (90sm) is entirely hard wood floored and air conditioned. The wide sitting room is furnished for both business meetings (leather sofa, armchairs) and for your resting hours after working time (minibar and high-techs: cable TV, Audio Sound System). The bedrooms are tastefully designed: double beds, large windows, gaily decorations. 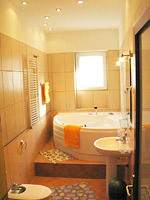 The bath facilities suit all your needs for a convenient stay: in one bathroom, the newest type of jacuzzi, bathtub and shower fixture and shower cabin in the service bathroom. 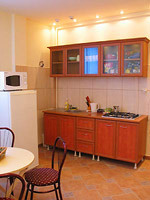 The kitchen is fitted with fridge, gas cooker, microwave oven. If you afford to estimate true quality of rental offers, this luxurious flat will remain as a pleasant memory. This luxury residential area of Bucharest offers everything: cultural or art events (museums, galleries, bookstores, The Romanian Athenee), churches, commercial centers or extravagant clubs, mainly on Magheru Blvd. and near the Hilton Hotel (La Mama Restaurant, Bistro Athenee, Turabo CafÃ©). Naturally enriched, don't miss the Cismigiu Park, all seasons attraction.